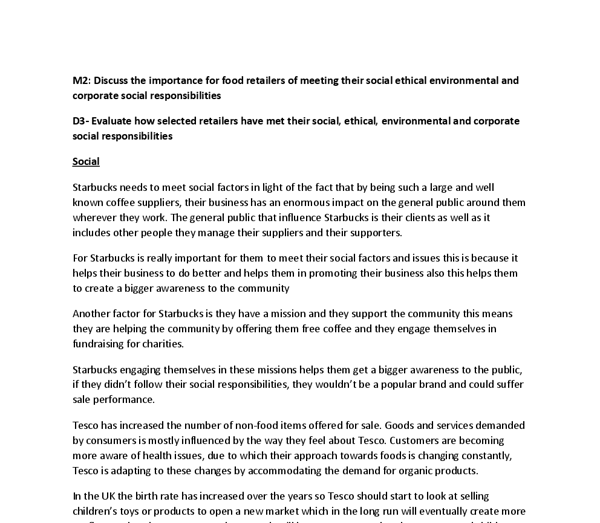 ﻿M2: Discuss the importance for food retailers of meeting their social ethical environmental and corporate social responsibilities D3- Evaluate how selected retailers have met their social, ethical, environmental and corporate social responsibilities Social Starbucks needs to meet social factors in light of the fact that by being such a large and well known coffee suppliers, their business has an enormous impact on the general public around them wherever they work. 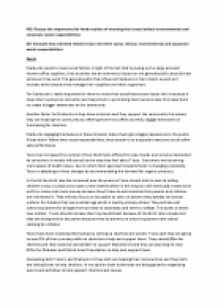 The general public that influence Starbucks is their clients as well as it includes other people they manage their suppliers and their supporters. For Starbucks is really important for them to meet their social factors and issues this is because it helps their business to do better and helps them in promoting their business also this helps them to create a bigger awareness to the community Another factor for Starbucks is they have a mission and they support the community this means they are helping the community by offering them free coffee and they engage themselves in fundraising for charities. Starbucks engaging themselves in these missions helps them get a bigger awareness to the public, if they didn?t follow their social responsibilities, they wouldn?t be a popular brand and could suffer sale performance. ...read more. The price of a banana bought in a UK supermarket has dropped from around 18p a decade ago to just 11p now. Starbucks use Fairtrade, this is really good because farmers and the people who grow it get paid good wages and if there wasn?t Fairtrade they wouldn?t get enough wages. On their website they use a lot of ethical sourcing with to help their suppliers and farmers. As we have just seen Tesco do not stock fair trade bananas and it?s really awful because the people who grow them and supply them to Tesco don?t get enough wages as we can see Starbucks they do Fairtrade and support their suppliers and farmers, this helps the business grow because people who visit their stores will be happy with their performance. People who buy bananas from Tesco might not be happy because they don?t do fair trade. Starbucks are following their ethical issues because they are doing fair trade and they help to support their farmers. Starbucks have to meet their ethical issues so they can do better and impress their customers and suppliers. Tesco on the other side is they are slightly not meeting their ethical responsibilities, they do fair trade on their other products but for bananas they don?t. ...read more. If Starbucks didn?t care about the environment, their customers won?t be happy with their performance and they overall might lose out sales. Another way they are meeting their environmental responsibilities by recycling and reducing the amount of waste they produce. Tesco are meeting their environmental responsibilities by reducing their carbon footprint by 50% by 2020 and minimise waste produced in their stores Comparing Tesco and Starbucks is Starbucks are doing a lot better this is because they are doing a lot more progress than Tesco for example is their reduction on recycling, energy, reduce the amount of water, and reduce environment footprints but when we look at Tesco is they are reducing carbon footprint, minimise waste and reduce energy. Reducing waste and emissions not only does it cost a lot of money, energy and natural resources to, it will help to retain the moisture and keep your grass green. The advantages for Tesco and Starbucks is their reputation will increase because they are taking care of the environment and already making progress, more people will go to their stores because they are meeting environmental responsibilities The disadvantage for Tesco and Starbucks is they have to spend money to make these changes happen. ...read more. Since 1997 TPF has been very successful and has attracted the customer's attention. Tesco were able to make personal finance profitable and in 1999 Tesco launched a new on-line bookstore and on-line banking website In 1998 Tesco Telecoms was launched, providing simple, straightforward telecoms services with great value tariffs. * Goods are dispatched on time * Completing delivery documents * Dealing with distribution problems such as; vehicle problems, bad weather etc. * Planning destination routes The main priority of distribution managers is to ensure products/processes run smoothly through Tesco Plc. This means that business must ensure that the goods must be available in order to provide the goods that people will higher affluence require. Those who are less affluent have impacted the food industry in terms of the increase in food discount stores and the economy ranges. management and common sense in order for them to spot any risks and take sensible measures to tackle them. Tesco must make sure that the regularly carry out risk assessments as they have more than five employees in each store which requires them to record the significant findings of the risk assessment.